I'm excited about a new book about midwives of southern Mexico: Touching Bellies, Touching Lives: Midwives of Southern Mexico Tell Their Stories. 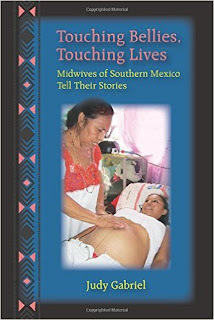 Written by Judy Gabriel, a doula in Oregon, this book tells the stories of more than 100 Mexican midwives. Judy has lived and traveled extensively in southern Mexico, and she was fascinated with the traditional midwives who were rapidly dying out, replaced by sterile clinics and sky-high cesarean rates. Judy began compiling these midwives' stories by asking a simple question: "Can you tell me about the very first birth you ever attended on your own?" From this question emerges an astonishing set of stories. You learn about how many of these women received their training from birth itself. Often they were thrown into a birth because no one else was available, and soon they were being called to another birth, and then another and another...The midwifery of southern Mexico was organic and self-taught and fluid. It also has come under direct attack from modern Mexican medicine, and unfortunately this hostility has accelerated midwifery's decline and near-extinction. Judy has organized the book into geographical regions, with brief narratives of her travels as she tries to locate and speak with as many remaining midwives as she can find. You'll travel with her from Oaxaca to Vera Cruz, from Tabasco to the Yucatan. Each midwife's story is narrated by Judy, who sets the scene and describes the woman in vivid detail. Judy recorded and transcribed her interviews, so the stories also contain long passages from the midwives themselves. Judy has also included photos of nearly all the midwives--a wonderful way to connect to these wise women. These stories gave me a glimpse into another world. Even though the midwives lived and worked in the 20th century, their lives were often unimaginably different from anything I have known. Alongside their midwifery journeys, you'll also read about the women's lives: childhood, marriage, babies, hardships. It's fascinating. Reading Touching Bellies, Touching Lives sometimes feels like reading a eulogy: Mexican midwives are an endangered species, and their extraordinary knowledge and experience are dying out with them. The transition from midwifery to obstetrics, and from home to hospital, was even more dramatic and abrupt in Mexico than in the US, and the pendulum swung more violently as well. Of particular value are the midwives' skills with the rebozo and massage. Seemingly simple but remarkably effective, these hands-on skills have helped countless women have better-positioned babies, more comfortable pregnancies and labors, and fewer complications in labor. We are lucky to have these midwives' stories captured in Judy's book. At the end, she gives me reason to hope that Mexico is starting to value its midwifery heritage: a new government-sponsored midwifery school in Guerrero trains midwives in both modern medicine and traditional midwifery skills and knowledge. If this trend continues, Touching Bellies, Touching Lives will be able to function not as a eulogy for a lost cultural practice, but as a guidepost and inspiration for anyone wanting to learn about or promote midwifery in Mexico. One day the village priest asked me to help a woman in labor. I asked why the midwife Lupe couldn't help her, and he said Lupe was getting too old to work. He said I would know what to do because my grandmother had been a midwife. I didn't know anything about childbirth. I'd never been with my grandmother when she attended a birth, and I hadn't had any babies myself. But the priest was insistent, so I went to the woman's house. She told me what to do. I just made a tea and fetched things for her and, when it was time, I held my hand under her skirt to catch the baby. When the placenta came, I thought it was her insides, but she explained what it as. She said I had to tie something around the cord, so I tore a strip of fabric from the bottom of my slip and used that. I was afraid to cut the cord; she had to do that herself. To learn more about the book, visit the book's website Touching Bellies, Touching Babies. Available for purchase on Amazon and from the publisher Waveland Press. I REALLY loved this book and wish it had been picked up by a mainstream publishing house instead of the equivalent of a university press. Thanks so much for your comment! I'm having a bit of a fan girl moment, since your book Baby Catcher was the first thing I ever read about midwifery and home birth. I knew instantly that this is what I wanted to pursue as my life's passion. I often use Baby Catcher in my freshman composition classes; because childbirth is a topic almost no student has thought about in depth, I find my students are more open to considering different ways of doing things. It's so sad to see so much knowledge and skills being lost!